She warned women that the Republicans want less government except when that comes to womens rights, voters rights, and immigrants. She made the case that Republican campaign rhetoric threatened security if any were elected due to their inexperience with the world community. She said the key to ISIS is continuing to form a world coalition, a formidable task which she has done in the past in forming the Iran boycott which moved Iran to agree to the nuclear nonproliferation agreement. On Health Care she chided both Donald Trump and Ted Cruz saying they want to roll back progress on health care. WPCNR CAMPAIGN 2016. By John F. Bailey. March 31, 2016: Hundreds turned up early this morning to wait to see Hillary Clinton at a campaign rally in Purchase in person and on closed circuit television. They heard a new Presidential-like, no-nonsense Hillary Clinton not only sounding Presidential but walking the walk. 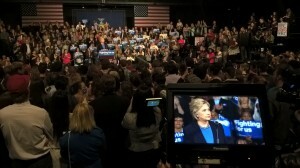 She delivered a message specifically criticizing Republican contenders for the Presidency and her rival for the Democratic Presidential nomination, Bernie Sanders for their lack of experience and lack of practical plans to deliver a better way of life for the American people and to keep us safe. The messages of the leading Republican candidates, she said would make it very difficult to forge alliances with Europe and allies to defeat ISIS because of Republican anti-Muslim remarks, saying it would be hard to obtain cooperation from Muslim nations to participate in a coalition against ISIS. She said Ted Cruz’s idea of monitoring Muslims in America, was mocked by the NYPD and New York City Police Commissioner William Braaton as “not knowing what the Hell he (Cruz) was talking about. “ She also pointed out that what would Cruz do with the 1,000 Muslim police officers in the NYPD. She said Sanders idea of providing free college to young people that would be paid for by the states which she mocked as unrealistic. She said she planned to attack the student loan problem by lowering interest rates on the loans students have going forward, and having students work at colleges to lower their financial commitment. This is detailed, she said on her website. Also appealing to students she planned an entrepreneurial program to aid young graduates in starting their own businesses. In a broader economic statement she said she wanted to encourage keeping jobs in this country by making it less attractive to move businesses overseas, and establish an infrastructure fund for the states to establish more jobs while repairing their physical plants. She alluded to this theme at the close saying the nation has to stop this and work together. She shook hands with as many persons surrounding the state as she could after the rally. I figured there were about 200 in the room and hundreds more watching on close circuit television in the larger SUNY Purchase theater. There was heavy security in effect.